At Lumenis, we truly understand retinal photocoagulation technology; that is after all only one of the privileges reserved for the company that pioneered the first argon laser photocoagulator for ophthalmology. Our newest line of premium ophthalmic endo-photocoagulation laser probes was designed with the retina specialist in mind. Advanced manufacturing practices, unique fiber polishing techniques and uncompromising quality assurance methodologies deliver product performance & reliability second to none. Furthermore, elements of ergonomics incorporated into the design of the LumeProbe hand-piece provide you with proprietary advantages of comfortable grip and easier guidance towards the treatment site throughout the laser procedure. Each LumeProbe was designed to be connected directly to a compatible laser port. In light of that, the LumeProbes do not require special adapters when being used with any SMA 905- or 906 connector-based devices, thereby eliminating laser transmission inefficiencies. Connecting the LumeProbe directly into the laser port without the need for an adapter ensures enhanced laser transmission efficiency of more than 8% compared to using a laser probe which requires an adapter. Laser parameters and power calibration remain valid throughout the procedure. Optimized energy transmission ensures the integrity of the probe’s protective polymer coating along with the adhesive bonding between the laser optical fiber and the hand-piece. Advanced laser probes manufacturing techniques and sophisticated quality-assurance methodologies which are based on over 25 years of experience provide you with product reliability and predictability you can count on from case to case. The LumeProbe product family was designed to deliver the results you come to rely on and expect from a premium product in order to achieve optimal clinical outcomes time and again. The LumeProbe product family consists of comprehensive and wide selection of ophthalmic endophotocoagulation probes to meet every clinical need and indication. These include standard, straight, curved, aspirating, illuminating and stepped in 20, 23 and 25 gauge sizes, among others. 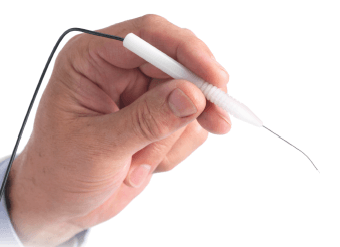 The LumeProbe 23 and 25 gauge selection provides you with the benefits of a less invasive procedure without compromising on the rigidity and stability of the probe during the operation. Based on over 25 years of laser probes manufacturing expertise, the LumeProbe product family was designed to deliver laser energy in the safest and most efficient manner, guaranteeing optimal clinical outcome for all relevant viteroretinal indications.